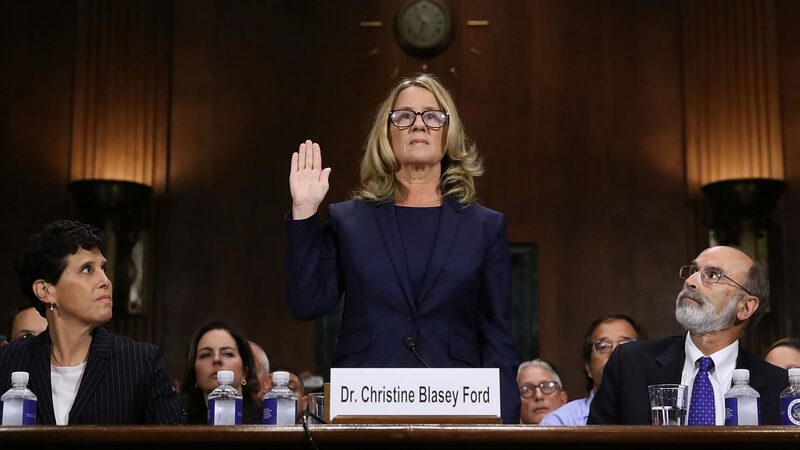 On 27th September 2018, Dr. Christine Blasey Ford testified in front of the Senate Judiciary Committee with allegations of sexual misconduct against Supreme Court nominee Brett Kavanaugh. Stating that a 17-year-old Kavanaugh had sexually assaulted her at a party in 1982, when she was aged only 15, Dr. Ford’s testimony led to two more survivors coming forward with allegations against Kavanaugh of sexual misconduct. Dr. Ford’s story and testimony led to an onslaught of death threats made against herself and her family; protests against Kavanaugh’s nomination; and mass sit-ins at major U.S. justice halls. She was further forced to bear what many women’s rights groups deemed a series of humiliating questions by a majority male-panel. But despite having to publicly re-live the obvious lifelong traumas of the incident in question in great detail, Dr. Blasey refused to back down and continued with her testimonials. “I am here today not because I want to be: I am terrified. Despite her emotional testimony and subsequent mass public outrage at Kavanaugh’s nomination, Kavanaugh denied the allegations and was confirmed as a Supreme Court Justice on 6th October 2018. Dr. Ford, a psychology professor at Palo Alto University in California, was forced to relocate following her testimony and as a result of death threats, was obliged to hire security for her family. A GoFundMe page was consequently set up with an aim of raising $150,000 to help her meet security costs. Within just two months, it had raised over $600,000. We hope Dr. Ford realises the extensive impact she has had on women survivors around the world. Her courage and determination to speak her truth against a member of one of the most powerful establishments of the U.S. justice system, helped highlight to a global audience the ongoing injustices, abuse and culture of disbelief all women face when speaking up against sexual violence.